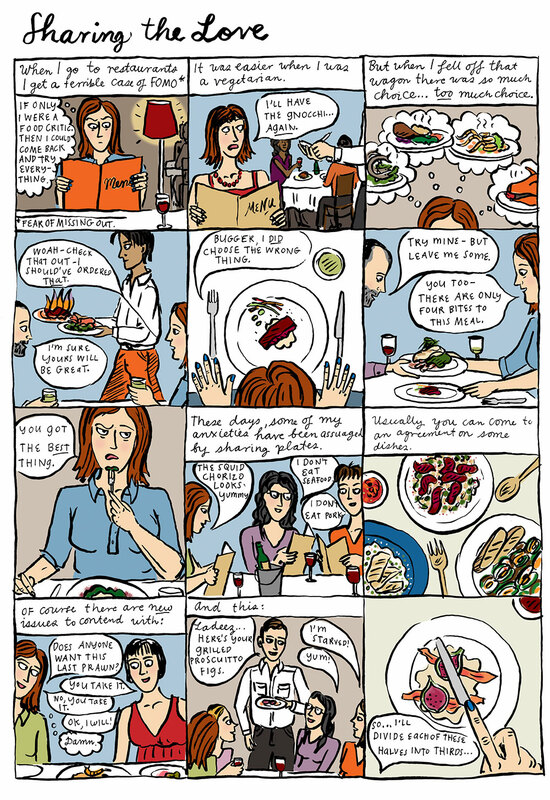 This is my comic for the restaurant issue of Metro Magazine, which is still on the newsstand for another few days so I’m jumping the gun by posting it here but… I just didn’t have time to draw any new comics for the blog because I was too busy getting myself ready for London! Yes, I am going to London tomorrow morning at 6.50am, which means I have to get up at the ungodly hour of 4am to get to the airport on time. So what am I doing blogging? I’m too excited to sleep. I haven’t been to London in over 11 years, when I was pregnant with my first child, Otto. I am taking part in the Australia New Zealand Festival of Literature and Arts, on the panel with the amazing Mary Talbot (Dotter of her Father’s Eyes) and Evie Wyld, whose beautiful book After The Fire , A Small Still Voice I read a few years ago. I am also taking a workshop on autobiographical comics. Did I say I was excited? My comic I was going to draw was going to be multiple panels of me jumping around in a tizz. Maybe I’ll still draw it and post it via my phone… or maybe I’ll be too busy swanning about the Southbank. Anyway, if you’re in London and you read my comic please come along and say hi! Safe travels exciting travels looking forward to seeing it crop up in your comics! Safe travels Sarah, I hope it all goes well.